What is the minimum diving certification level required for diving in Morotai? Generally an advance open water (AOW) diving certification level are required in most of the dive sites in Morotai. Only several dive sites that Open Water Scuba Diver certification level is allowed. We also require all of the guests bring their own Dive Computer while diving in Morotai, if you don’t bring you own, you can rent it from us. What is the best season for diving in Morotai? Generally diving in Morotai can be done in all year round, however, the best season for diving is from end of March to early of July each year, where the ocean is considered flat and the wind is calm. Do you conduct shark feeding during diving in Morotai? Shark provisioning is common practice (40% as per Carwardine and Watterson (2002)) in more than 10 countries in the world, from South Africa to the Bahamas. Long term shark behavior research by Aleksandra Maljkovic and Isabelle Cote (2011) in the Bahamas proves that no evidence for shifts in the behavior of the reef sharks due to shark feeding. 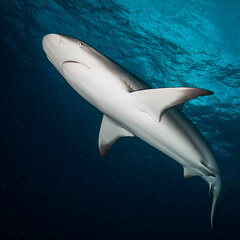 Similar study in Fiji by Joerg Brunschweiller and Adam Barnett (2013) also resulting in regardless of feeding or non-feeding day the reef sharks behavior remains unchanged. Therefore, we responsibly conduct the shark feeding and provided that shark has maximum daily consumptions we don’t feed the shark more than 0.5 kg of chunk of fish per individual. Should I book directly to Shark Diving Indonesia or through other party/dive center to dive in Morotai? We offer some benefits if you book directly to our Dive Center, for example: Free T-Shirt for each diver (if you bring group of 8 divers), Reduced price for the future diving with us, etc. For special request we also offers: Personal Guide, Full flag service for special meal request. However, we also receive other dive center’s requests in Indonesia, with a discounted rate for the Dive Shops/ Dive Centers that has a mutual agreement with us. Where is Morotai ? Is it safe to travel to Morotai? Morotai lies in eastern part of Indonesia, yet it is also noted as one of the northest point in Indonesia. As typically East Indonesia, Morotai offers clean and undisturbing sand beaches and island,with a pristine quality. Morotai is safe, since 2000 there are no significant unrest in Morotai, so you can visit us safely. We will assist and suggest what the accomodation you might select, for your safety, comfortability and budget. What about flight to Morotai? Among main hub in Indonesia that connected to Morotai is Jakarta, Manado, Makassar, so if you have a plan to visit Morotai, choose the flight from those cities. Domestic flights normally imposes a weight restriction of 20 kg per person. We can assist in securing your domestic flight reservations if you are planning an extended vacation in Indonesia. Currently, domestic flight from Ternate to Daruba (Morotai) is conducted by Susi Air every Monday, Tuesday, Wednesday, and Friday. Please contact our Dive Coordinator for more details on how to book the tickets. What money should I carry? We accept IDR (Indonesian Rupiah) and US Dollar payment. In Morotai, there are only few (3 currently) Automatic Teller Machine (ATM), so we suggest you to bring enough cash prior to go to Morotai, just in case those ATM are run out of money, which happens several times before. Morotai lies in the just North of Equator and on the brink of Pacific, so the rainy season in the western part of Indonesia, doesn’t necessarily the same weather in the Morotai would be. Generally speaking, there are very rare to have continuous rain during consecutive days. Morotai humidity is lower than most western part of Indonesia, ranging from 50 – 80%. April-June each year is time for South Wind, while December-February is time for North Wind in Morotai Island. We have many dive sites that are less affected by weather, and only if the wave and weather conditions are not safe (which is very rare), first, we offer an alternative dive in other location that is safer or if the weather goes into an unwanted event, we will cancel the dive. We suggest you to turn on the BMKG website, observe the weather forecast for the following week and – if necessary – you can also contact us to see what the current weather out there. Is there malaria and dengue fever in the area? As many other part of Indonesia, malaria and dengue fever still pose some treat. We advise you to bring plenty of mosquito repellent and consult to your doctor prior to the trip. Many general medical doctors in Indonesia are well trained to handle the malaria and dengue fever patient, so you don’t need to worry. If I get there, to be optimum, how long should I stay? Depends on what type of diver are you, but we can say 5D/4N is the optimum one, meet both the transportation schedule and various dive sites you can visit. However if you opt for one day trip (arrive in the morning and depart at evening) we can also select our best sites for you in the closest proximity to Daruba Port, provided that you have to go back in the same day. I don’t bring my equipment, do you provide us with dive equipment in a good conditions? Sure, our equipment is quite new (bought in 2013 and 2014), and we always maintain these equipment in a regular base, as recommended by the manufacturer. You can check and try our equipment in situ, so you don’t need to worry. Last, you need to bring your own Dive Computer while diving in Morotai, otherwise you should rent it from us. I am a Macro photographer, do Morotai offer the best macro site for me? As you may aware, Morotai is among the best location for pelagic (wide) photographer, as it has many locations full with big fishes and wrecks. But you don’t need to worry, since Morotai also has several dive sites for macro photography: from the muck diving to the garden of the seagrass on many islands. Eastern Morotai – according to our last survey in January 2015 – is also potential for macro diving. In September 22nd, 2014 we also found the walking shark in Morotai, so there is a plenty of space for your macro adventure. Please e-mail us in advance so we have possibility to select you the best site for your photographic hobby / profession. If you don’t bring your camera, we also rent for the underwater camera both pocket or DSLR type, ask our crew if you want to rent . Is it possible to bring my personal dive guide out there? Of course, we allow you to bring your personal dive guide, but you must also be accompanied by at least one of our dive guide, as we have an operating procedure that all dives must be accompanied by our guide – not to mention that our guide knows better the location and the environment of Morotai diving. If you ask for personal guide, depends on the availability, for sure we can manage to have one for you.